The Bivar Surface Mount LED SM0402 » Electronic Salesmasters Inc. 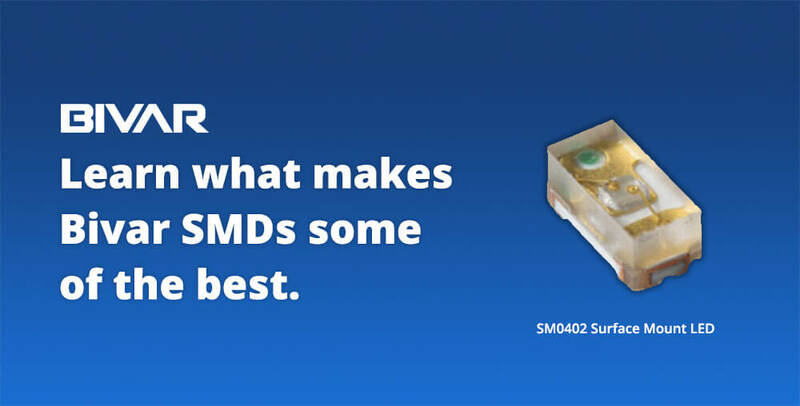 Explore the new 0402 series of SMD LEDs from Bivar; they offer 100 mcd at a 130 degree viewing angle. Bivar’s new 0402 series is a great addition to their line of surface mount LEDs. Surface mount LEDs are especially welcome in portable devices because they use metallic contacts instead of wiring, and the 0402 series is no different. Shining at 100 mcd intensity makes for a strong indicator light, and its 130 degree viewing angle makes it hard to miss no matter where you sit. The 0402 series is available in seven different colors: blue, green, orange, pure green, red, yellow, and white. We are honored to serve as a manufacturer’s rep for Bivar.